It only took a few days to get ready to process the two roosters we butchered last week. By day three, I was ready. They had soaked in a saltwater brine for the full three days. Some say to soak them longer, some say just a day. I picked three days only because we went on vacation. 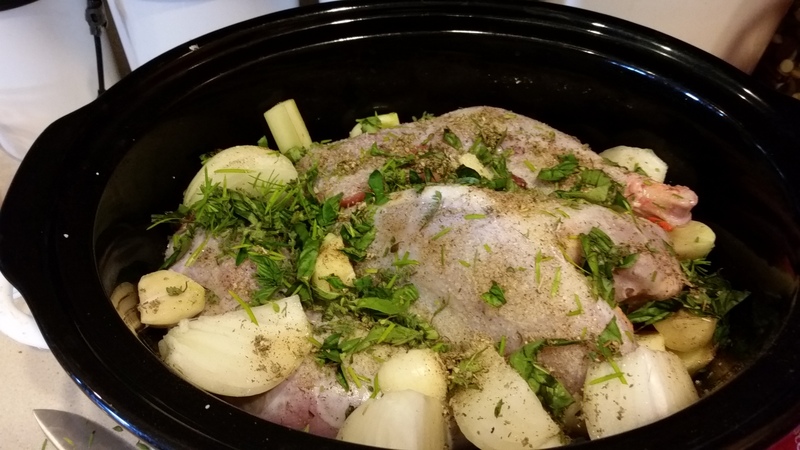 For the dinner, I threw a bird in the slow cooker with apples, onions, carrots, celery, fresh garlic from the garden and a random selection of fresh herbs. I cooked it on low for 24 hours and then switched to “keep warm” for the afternoon. The aroma that filled the house was mouthwatering. 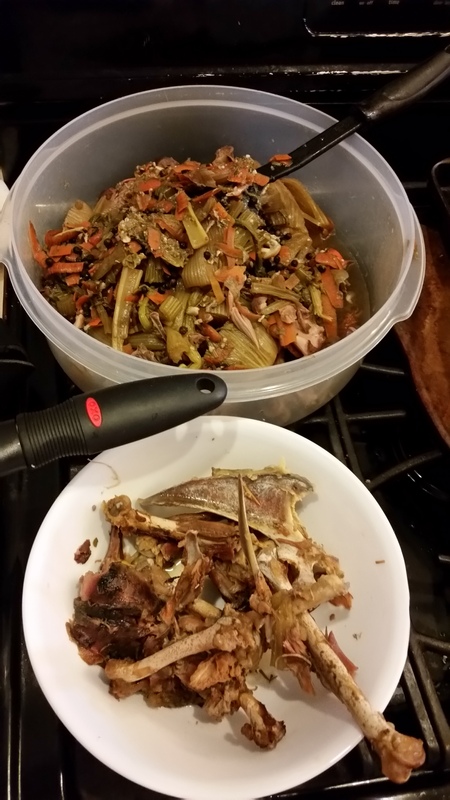 For the bone broth, I filled a big stockpot with water and dumped a freezer bag full of onion tops, celery and carrot scraps I’d been saving for just such an occasion. I also threw in two whole bulbs of fresh garlic. I simmered it for a full day. 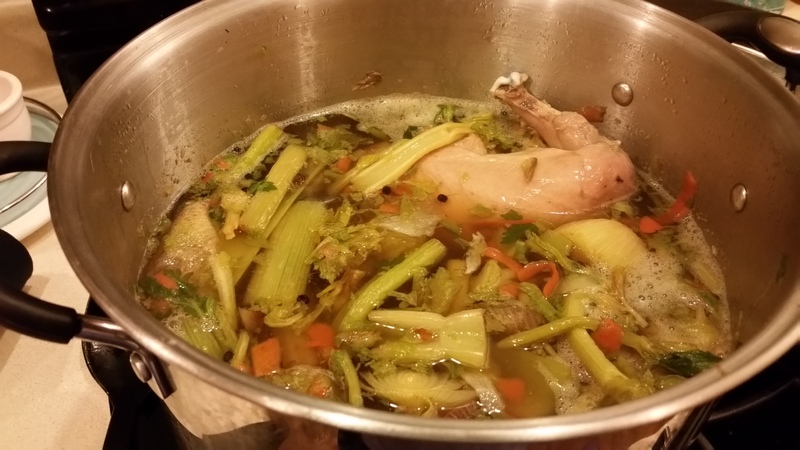 When I went to strain the broth, the chicken fell right off the bone. The boys and I sampled it. It does not taste like store-bought chicken and it is much darker with very, very little fat. 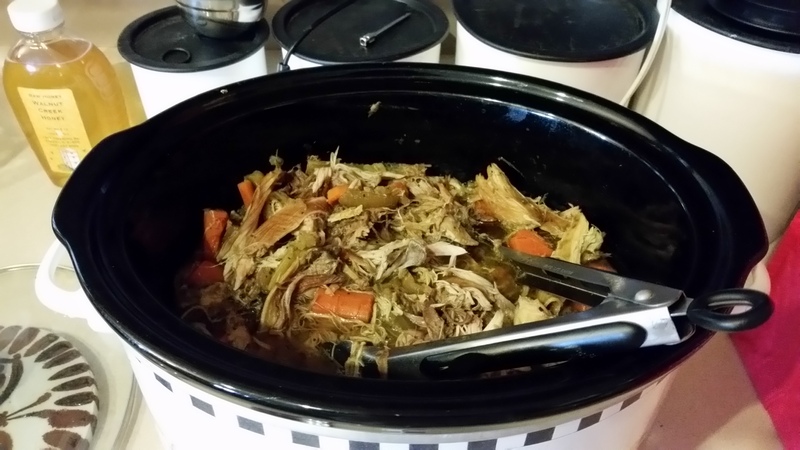 I added the shredded chicken to the crock pot and the veggies went to the chickens. They were happy little hens. I cooked rice for dinner and spooned the tender chicken and veggies over it. It was delicious. The apples added a nice sweet flavor and the carrots were perfect. The meat was not dry like it was the last time I tried cooking a fresh bird and the boys each had two helpings. 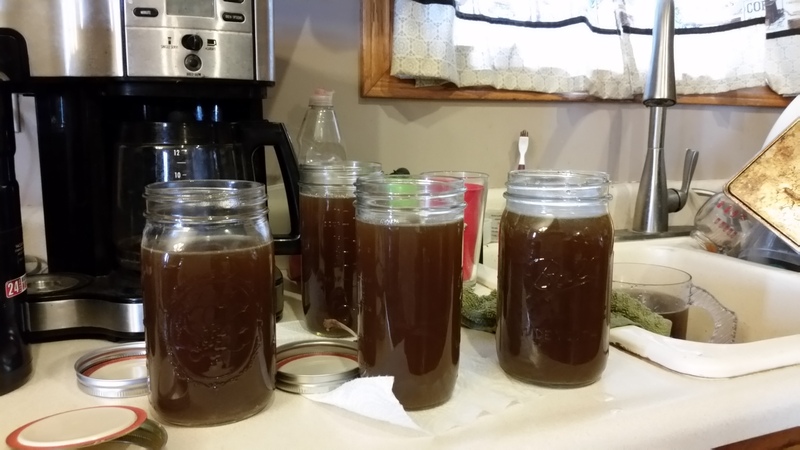 From two big roosters, we got 6 quarts of bone broth and 3 days worth of meals. I’ll freeze the little that is left over and make enchiladas next week. YUM! This entry was posted in Canning, Chickens!, Food, Preparedness. Bookmark the permalink. Melissa is there a difference in taste between rooster and a hen? I have a friend out in OK who says that roosters tasted bad compared to hens. He raises chickens as well. I don’t think I have ever had rooster myself as all our store bought chickens are labeled as hens. Very curious to see if you can taste a difference. Thanks! I’m not sure if it is because it’s a rooster, but it definitely tastes diffirent than store-bought. 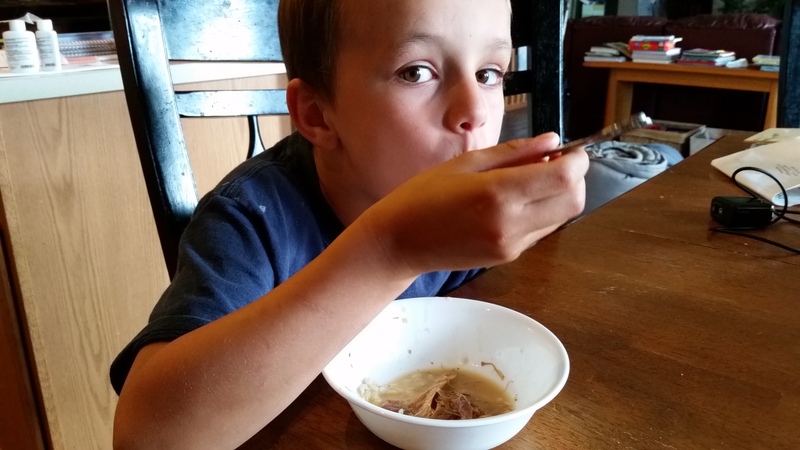 Not bad…especially slow-cooked with onions and apples. Well after your description I had to have Chicken tonight!